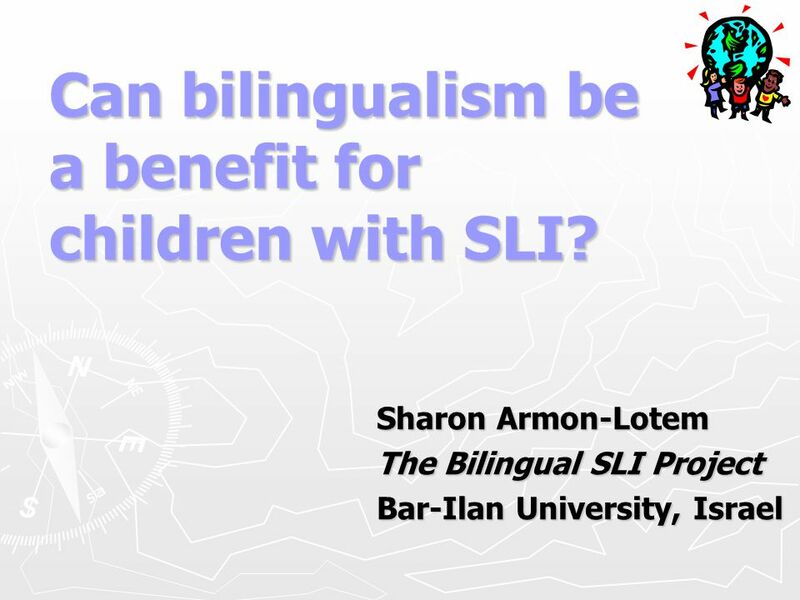 Can bilingualism be a benefit for children with SLI? 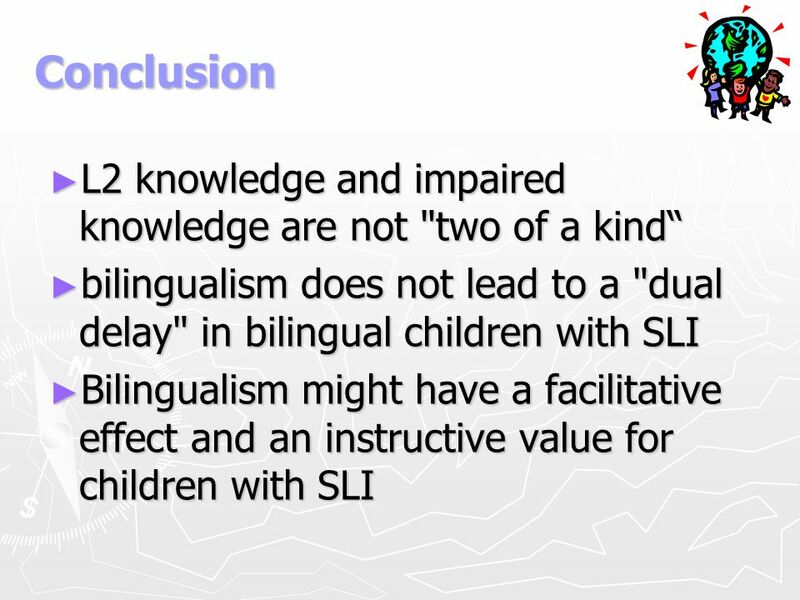 1 Can bilingualism be a benefit for children with SLI? 2 Acknowledgement This research was supported in part by THE ISRAEL SCIENCE FOUNDATION (grant No.938) and by the BMBF funded Consortium “Migration and societal Integration”. 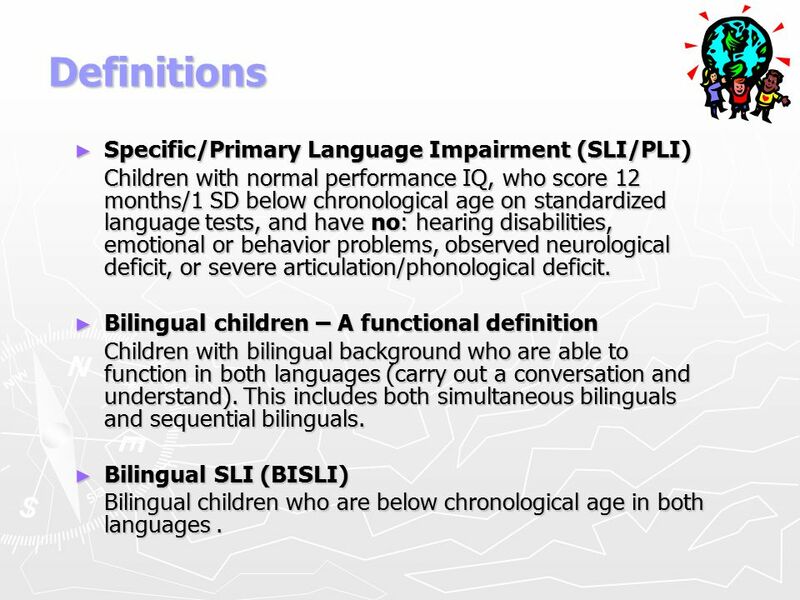 Children with normal performance IQ, who score 12 months/1 SD below chronological age on standardized language tests, and have no: hearing disabilities, emotional or behavior problems, observed neurological deficit, or severe articulation/phonological deficit. 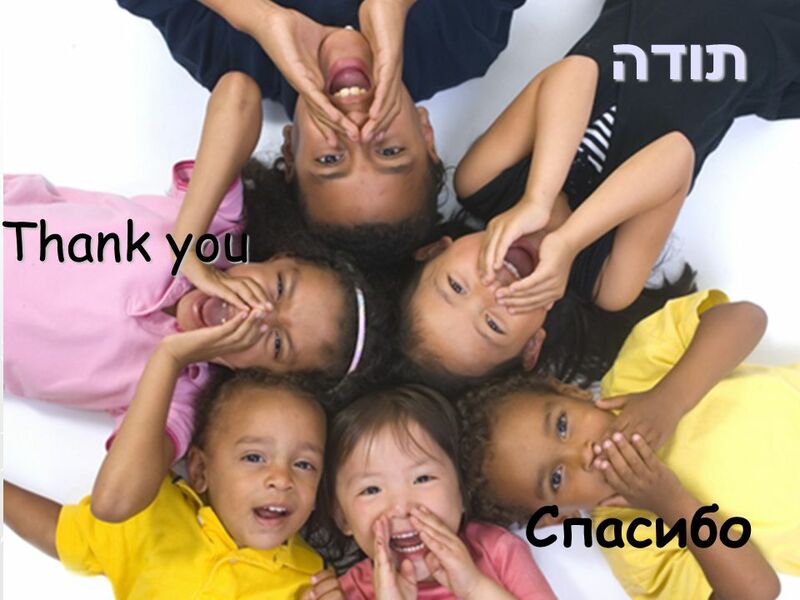 Bilingual children – A functional definition Children with bilingual background who are able to function in both languages (carry out a conversation and understand). This includes both simultaneous bilinguals and sequential bilinguals. 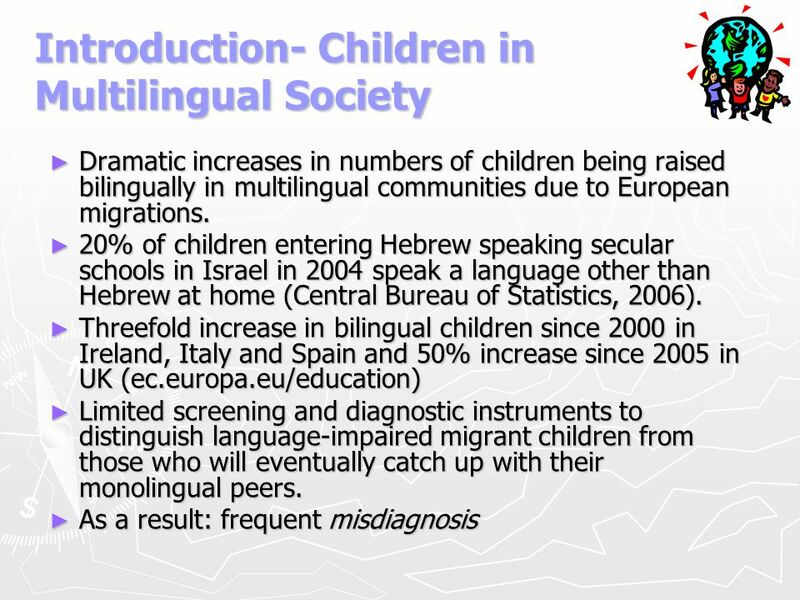 Bilingual SLI (BISLI) Bilingual children who are below chronological age in both languages . 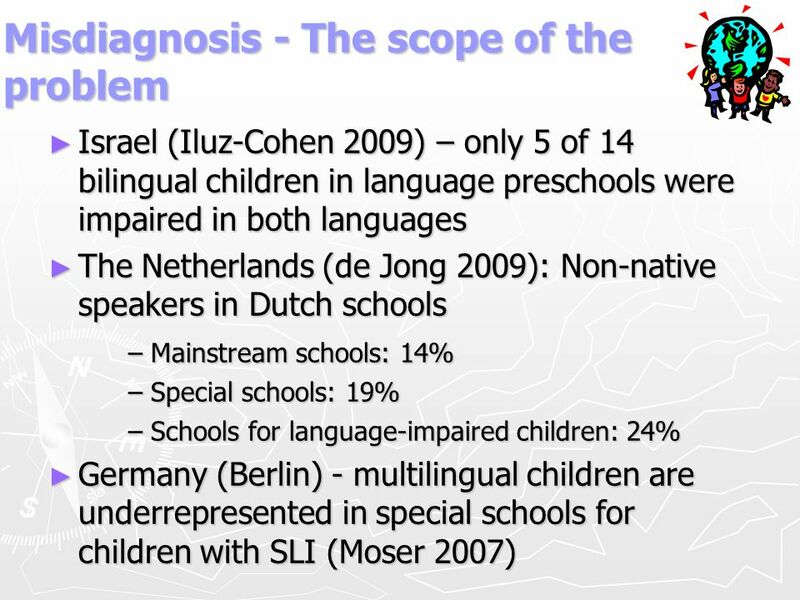 Israel (Iluz-Cohen 2009) – only 5 of 14 bilingual children in language preschools were impaired in both languages The Netherlands (de Jong 2009): Non-native speakers in Dutch schools – Mainstream schools: 14% – Special schools: 19% – Schools for language-impaired children: 24% Germany (Berlin) - multilingual children are underrepresented in special schools for children with SLI (Moser 2007) Only a decade ago, a very few researchers considered the study of language disorders in bilingual population worth pursuing. 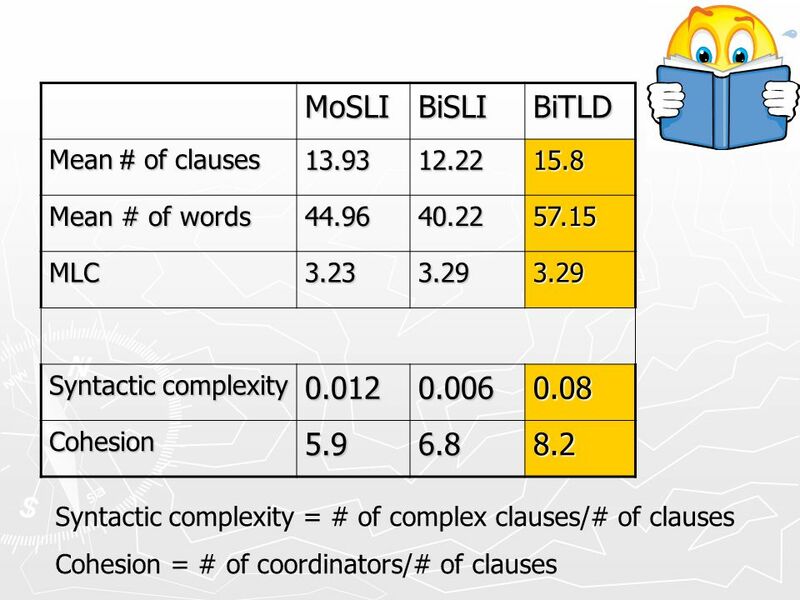 It was mostly argued that there were enough challenges in studying bilingualism, and even more challenges in the study of Specific Language Impairment (SLI), so why complicate things and combine the two domains. 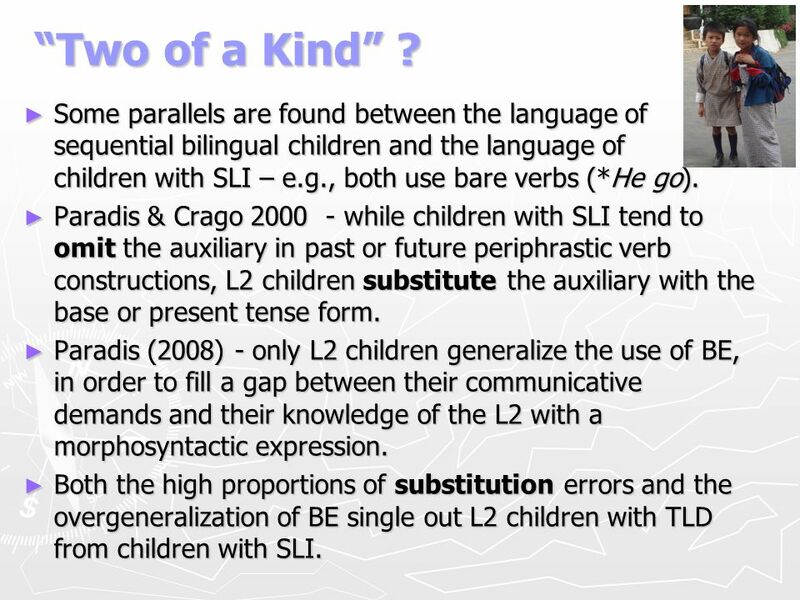 Are bilingualism and SLI “two of a kind?” (Crago & Paradis, 2003) Do bilingual children with SLI show a "double delay?” (Paradis 2007; Paradis et al. 2003; Paradis et al. 2005/6). 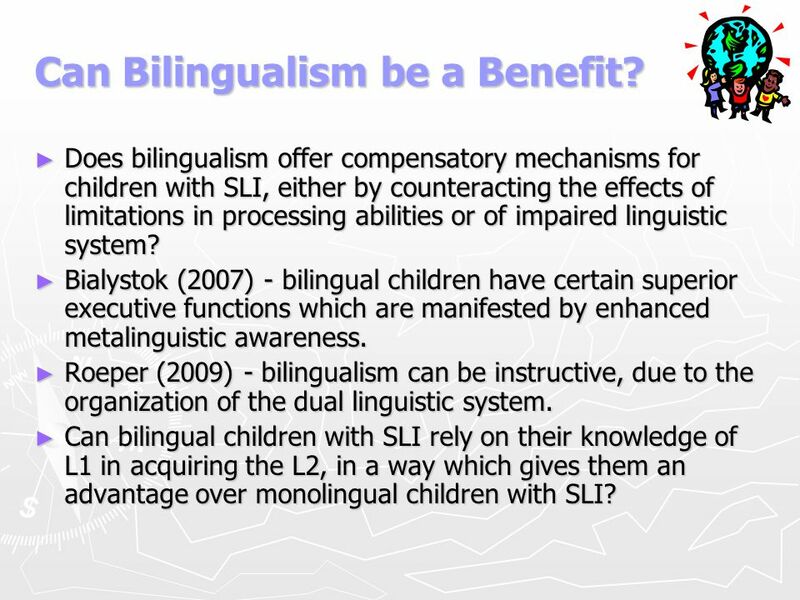 Can bilingualism be a benefit for children with SLI? 9 “Two of a Kind” ? 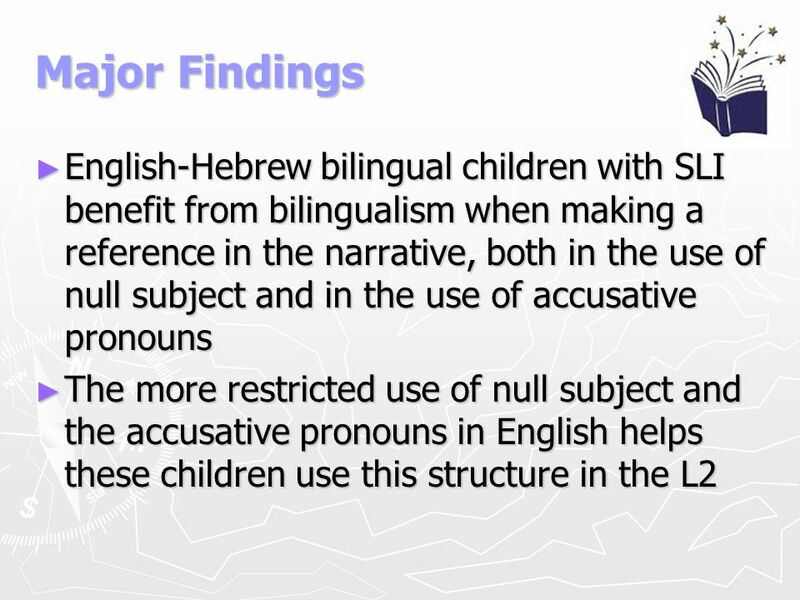 Some parallels are found between the language of sequential bilingual children and the language of children with SLI – e.g., both use bare verbs (*He go). Paradis & Crago while children with SLI tend to omit the auxiliary in past or future periphrastic verb constructions, L2 children substitute the auxiliary with the base or present tense form. 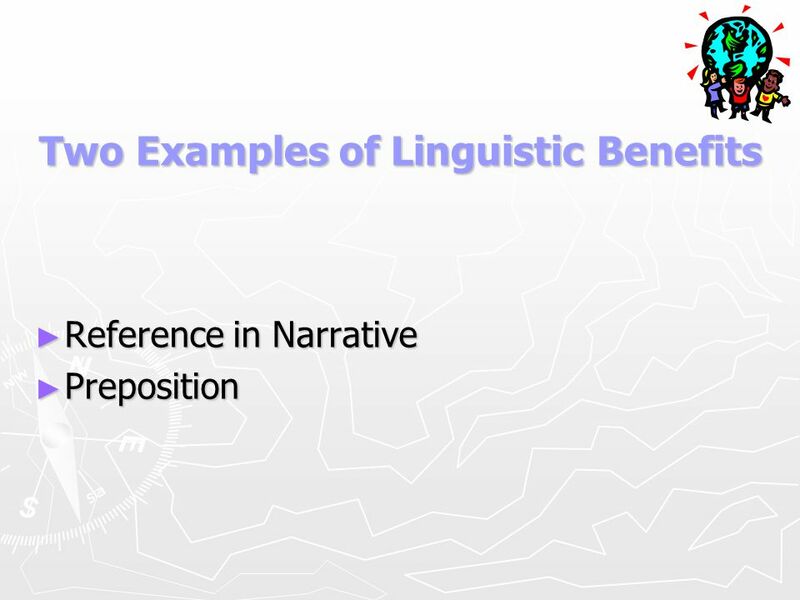 Paradis (2008) - only L2 children generalize the use of BE, in order to fill a gap between their communicative demands and their knowledge of the L2 with a morphosyntactic expression. Both the high proportions of substitution errors and the overgeneralization of BE single out L2 children with TLD from children with SLI. 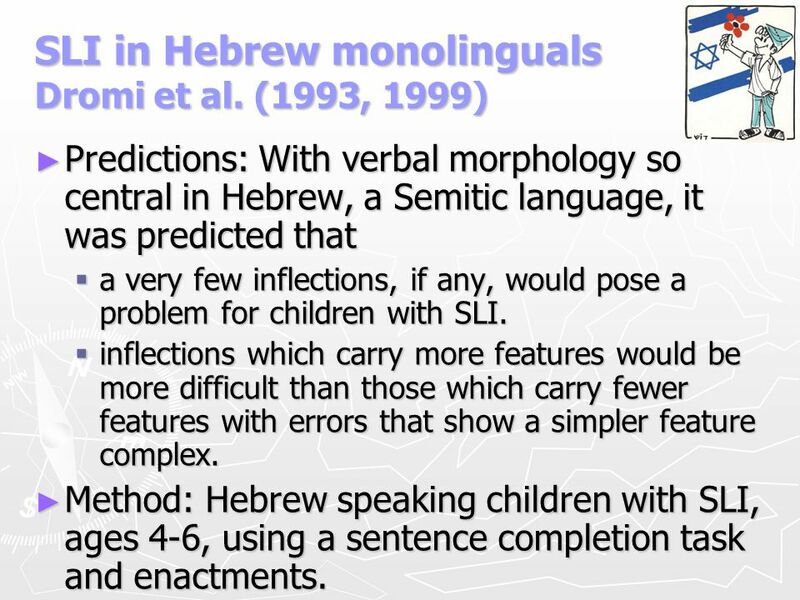 Predictions: With verbal morphology so central in Hebrew, a Semitic language, it was predicted that a very few inflections, if any, would pose a problem for children with SLI. inflections which carry more features would be more difficult than those which carry fewer features with errors that show a simpler feature complex. 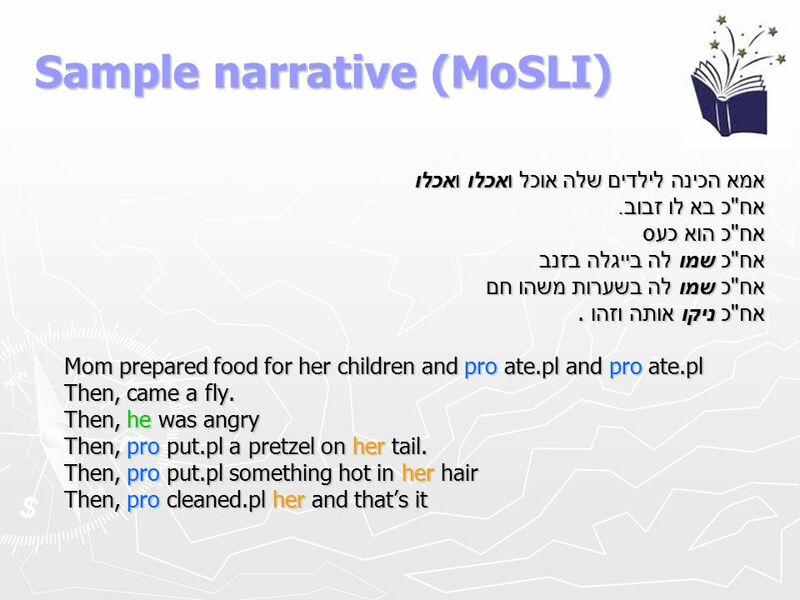 Method: Hebrew speaking children with SLI, ages 4-6, using a sentence completion task and enactments. 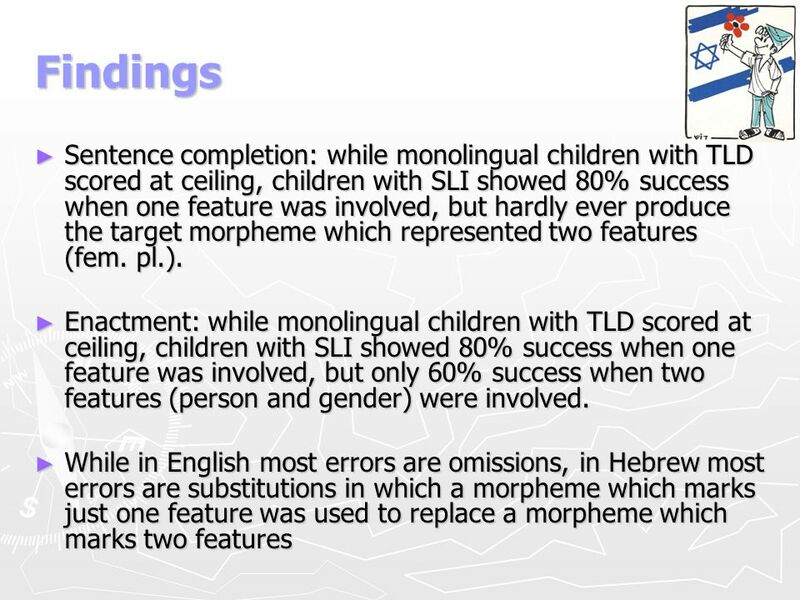 14 Major Findings Speakers of Hebrew as L2 whose L1 is English, are almost at ceiling for all three morphemes after two years of exposure to Hebrew Speakers of Hebrew whose L1 is Russian with a similar length of exposure are at ceiling for two of the three morphemes, but score like monolingual children with SLI on the plural morpheme. 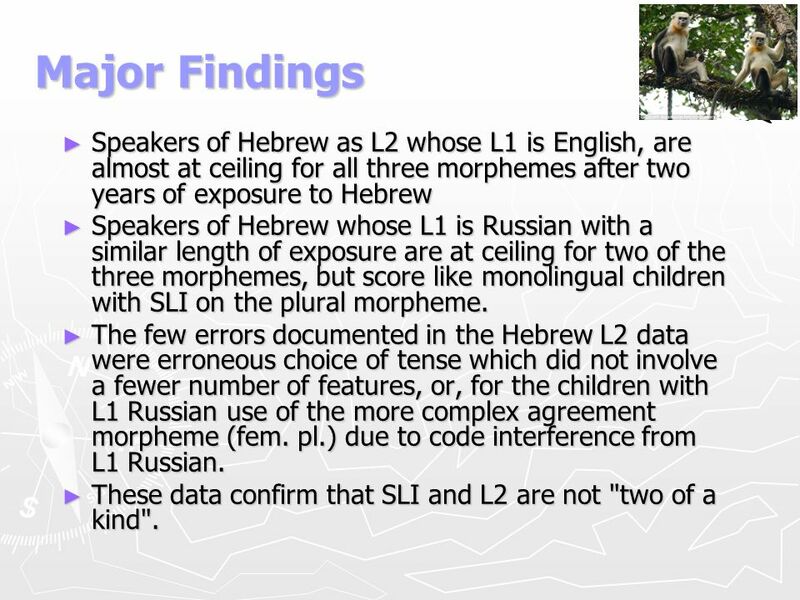 The few errors documented in the Hebrew L2 data were erroneous choice of tense which did not involve a fewer number of features, or, for the children with L1 Russian use of the more complex agreement morpheme (fem. pl.) due to code interference from L1 Russian. 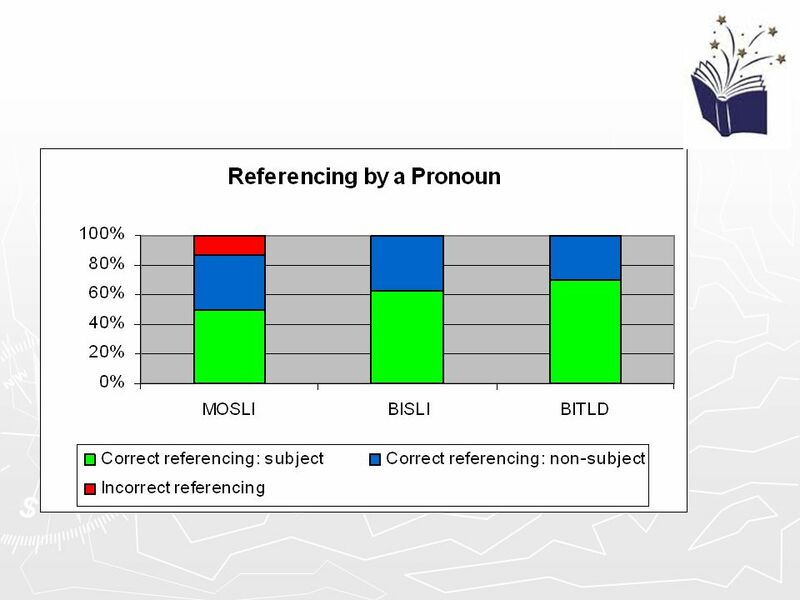 These data confirm that SLI and L2 are not "two of a kind". 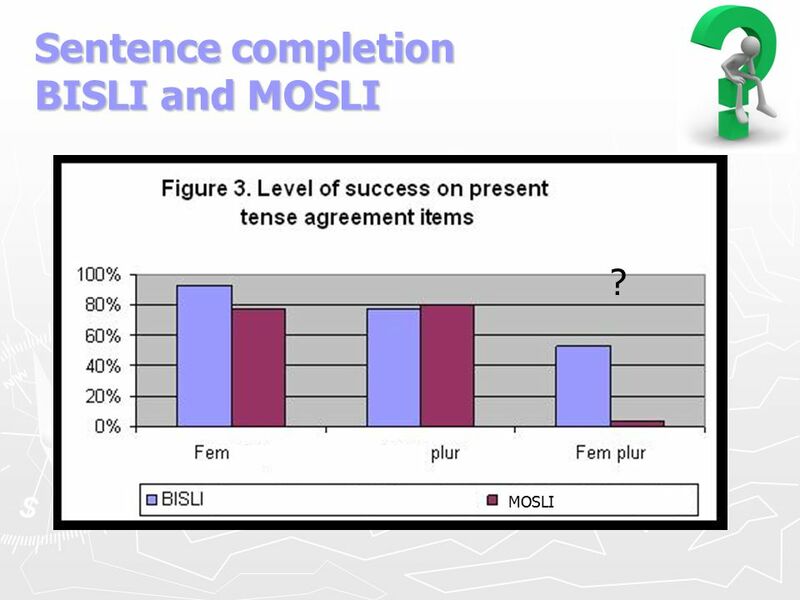 Due to limited processing capacity (LPC) children with SLI would need more exposure to fully acquire linguistic paradigms. 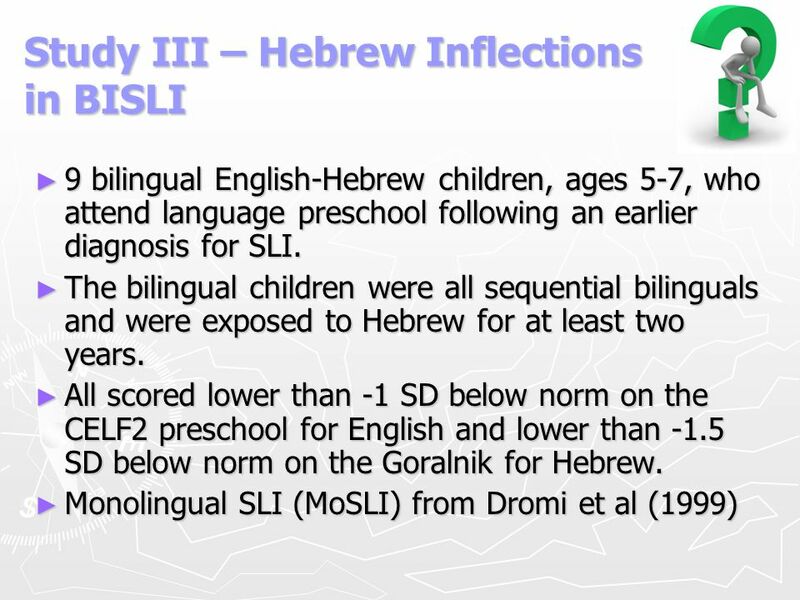 Bilingual children with SLI have less frequent exposure to each language by being bilingual, and have functionally less exposure being SLI. 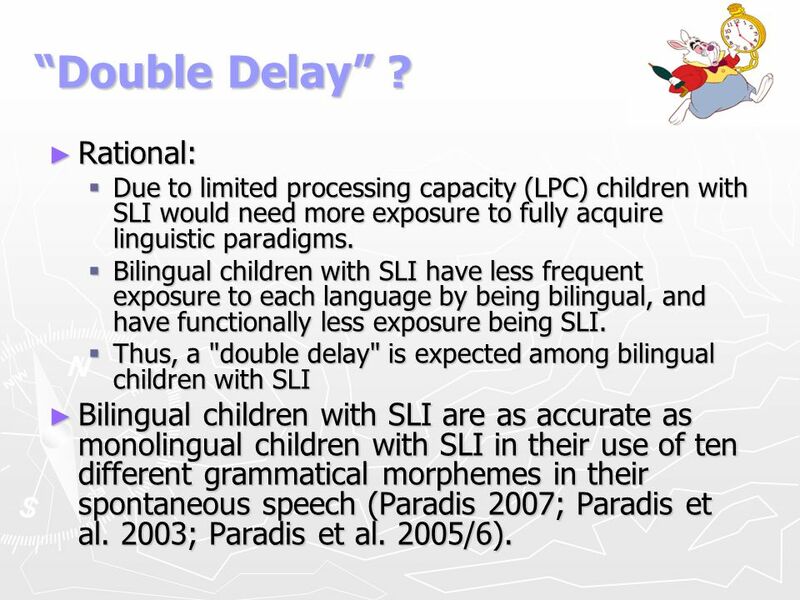 Thus, a "double delay" is expected among bilingual children with SLI Bilingual children with SLI are as accurate as monolingual children with SLI in their use of ten different grammatical morphemes in their spontaneous speech (Paradis 2007; Paradis et al. 2003; Paradis et al. 2005/6). 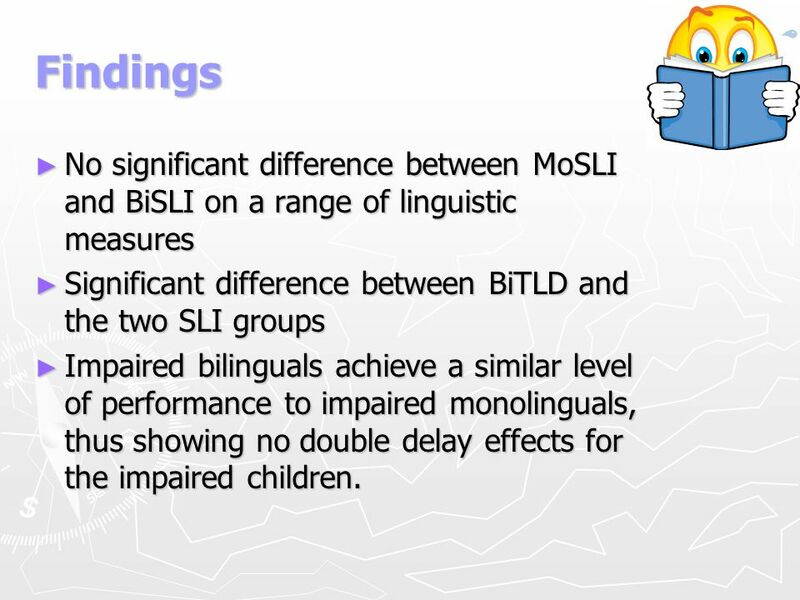 18 Findings No significant difference between MoSLI and BiSLI on a range of linguistic measures Significant difference between BiTLD and the two SLI groups Impaired bilinguals achieve a similar level of performance to impaired monolinguals, thus showing no double delay effects for the impaired children. 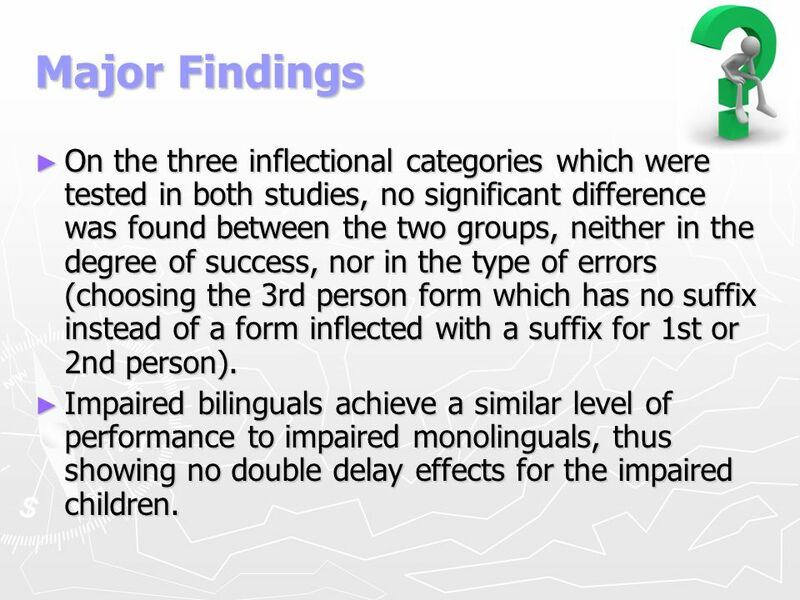 21 Major Findings On the three inflectional categories which were tested in both studies, no significant difference was found between the two groups, neither in the degree of success, nor in the type of errors (choosing the 3rd person form which has no suffix instead of a form inflected with a suffix for 1st or 2nd person). 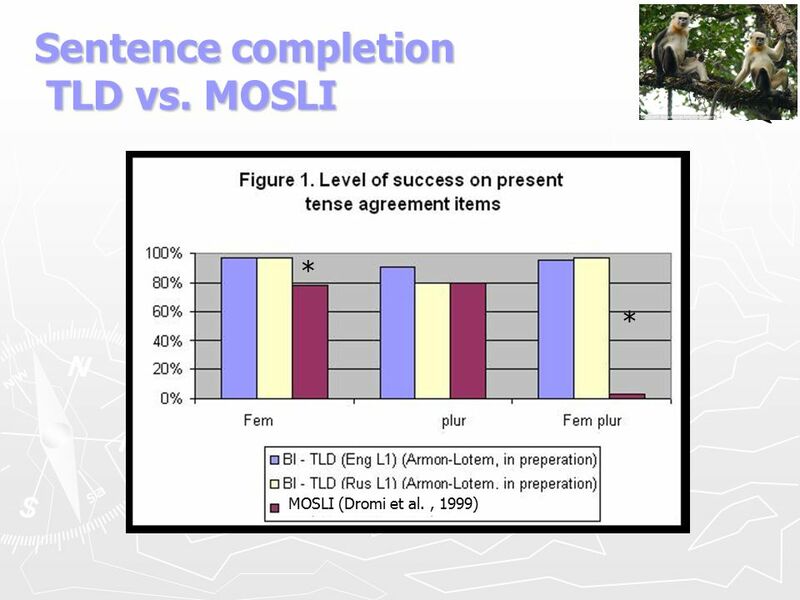 Impaired bilinguals achieve a similar level of performance to impaired monolinguals, thus showing no double delay effects for the impaired children. 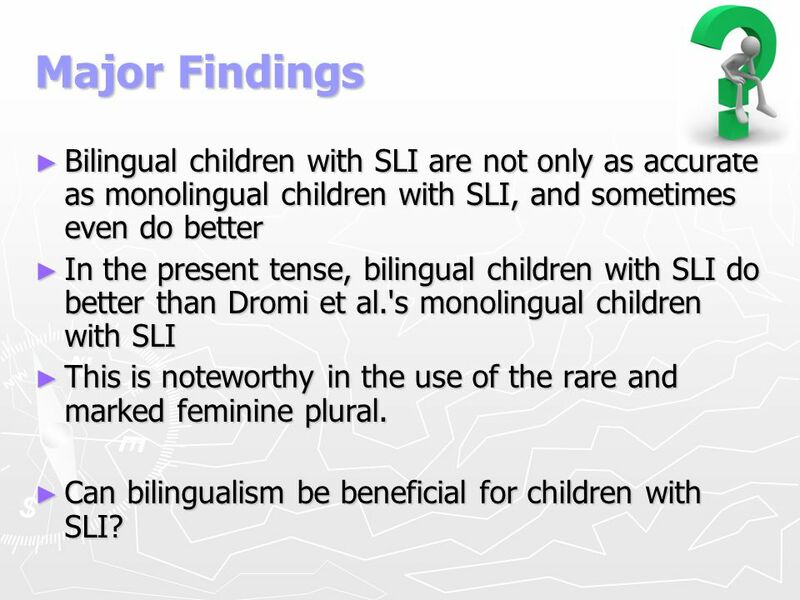 23 Major Findings Bilingual children with SLI are not only as accurate as monolingual children with SLI, and sometimes even do better In the present tense, bilingual children with SLI do better than Dromi et al. 's monolingual children with SLI This is noteworthy in the use of the rare and marked feminine plural. 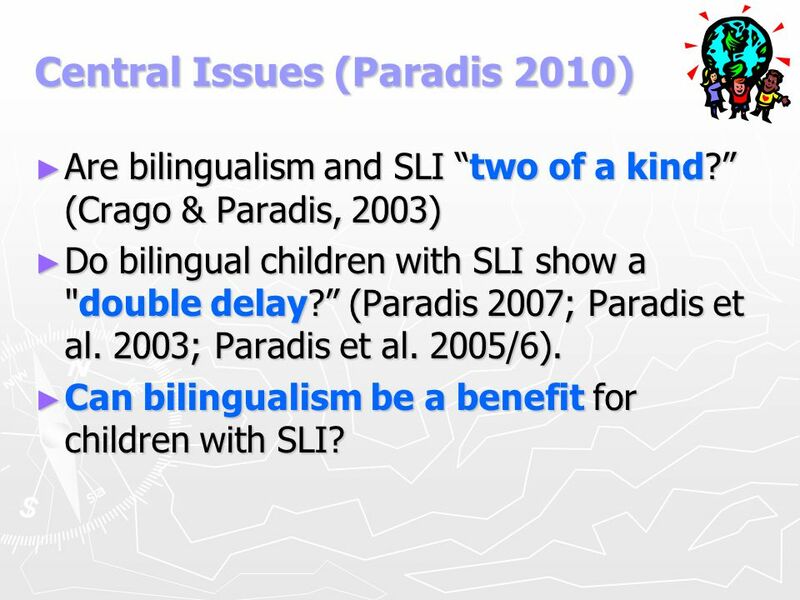 Can bilingualism be beneficial for children with SLI? 24 Can Bilingualism be a Benefit? Does bilingualism offer compensatory mechanisms for children with SLI, either by counteracting the effects of limitations in processing abilities or of impaired linguistic system? Bialystok (2007) - bilingual children have certain superior executive functions which are manifested by enhanced metalinguistic awareness. Roeper (2009) - bilingualism can be instructive, due to the organization of the dual linguistic system. 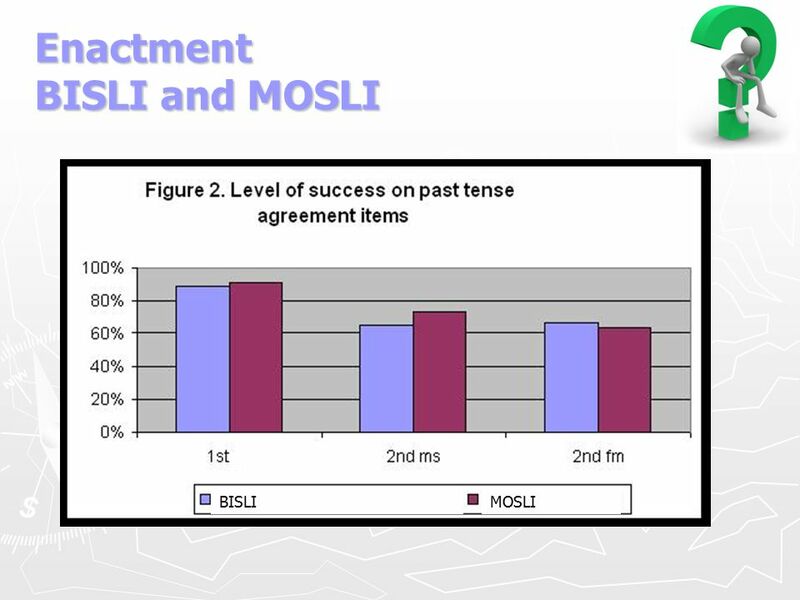 Can bilingual children with SLI rely on their knowledge of L1 in acquiring the L2, in a way which gives them an advantage over monolingual children with SLI? 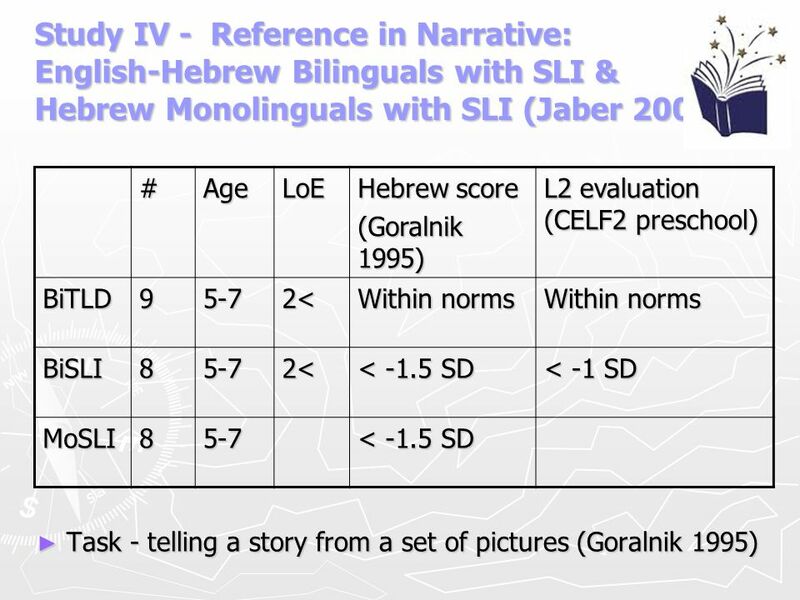 31 Study V - The use of Prepositions: Russian-Hebrew Bilinguals with SLI, English-Hebrew Bilinguals with SLI & Hebrew Monolinguals with SLI # Age LoE Hebrew score (Goralnik 1995) L2 evaluation English-Hebrew 8 5-7 2< < -1.5 SD < -1 SD (CELF2 preschool) Russian-Hebrew 3 6-7 parents reported delay in L1 Russian. 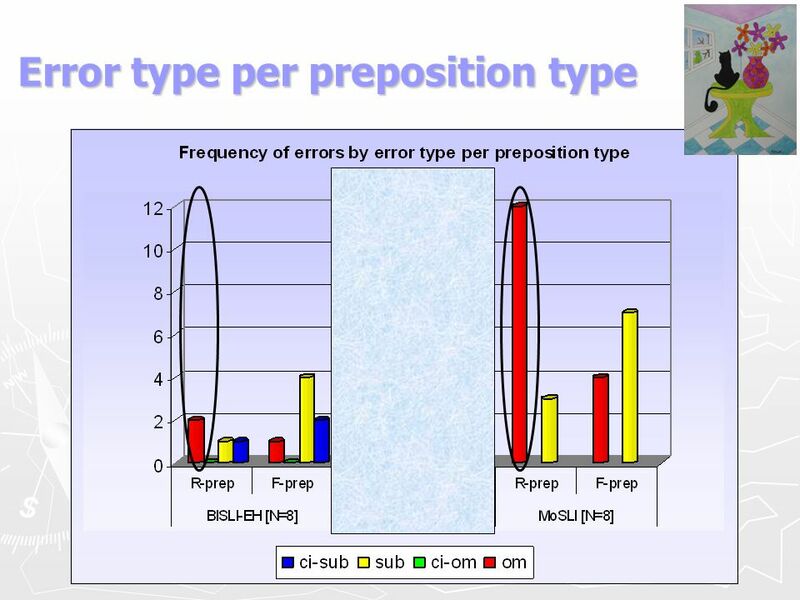 All were receiving treatment by an SLP MoSLI 5;6-7 Task – Sentence Repetition, two types of preposition. 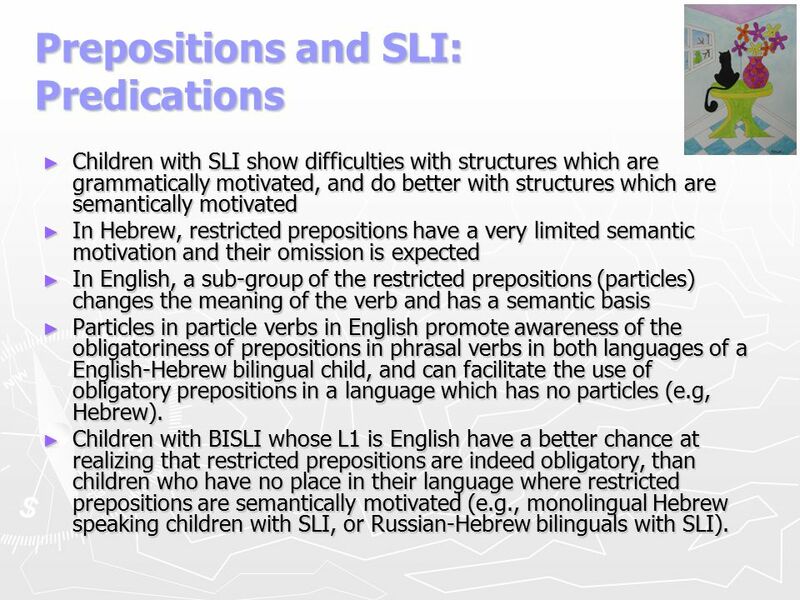 Children with SLI show difficulties with structures which are grammatically motivated, and do better with structures which are semantically motivated In Hebrew, restricted prepositions have a very limited semantic motivation and their omission is expected In English, a sub-group of the restricted prepositions (particles) changes the meaning of the verb and has a semantic basis Particles in particle verbs in English promote awareness of the obligatoriness of prepositions in phrasal verbs in both languages of a English-Hebrew bilingual child, and can facilitate the use of obligatory prepositions in a language which has no particles (e.g, Hebrew). 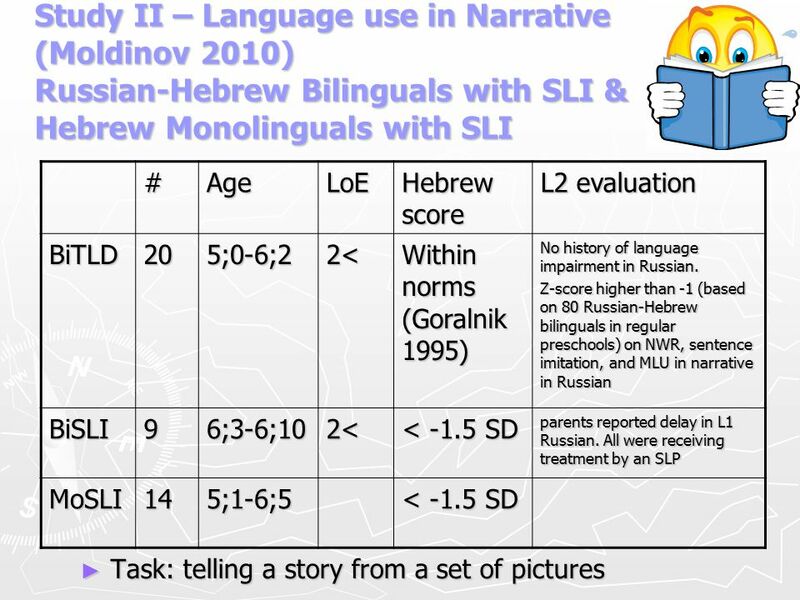 Children with BISLI whose L1 is English have a better chance at realizing that restricted prepositions are indeed obligatory, than children who have no place in their language where restricted prepositions are semantically motivated (e.g., monolingual Hebrew speaking children with SLI, or Russian-Hebrew bilinguals with SLI). 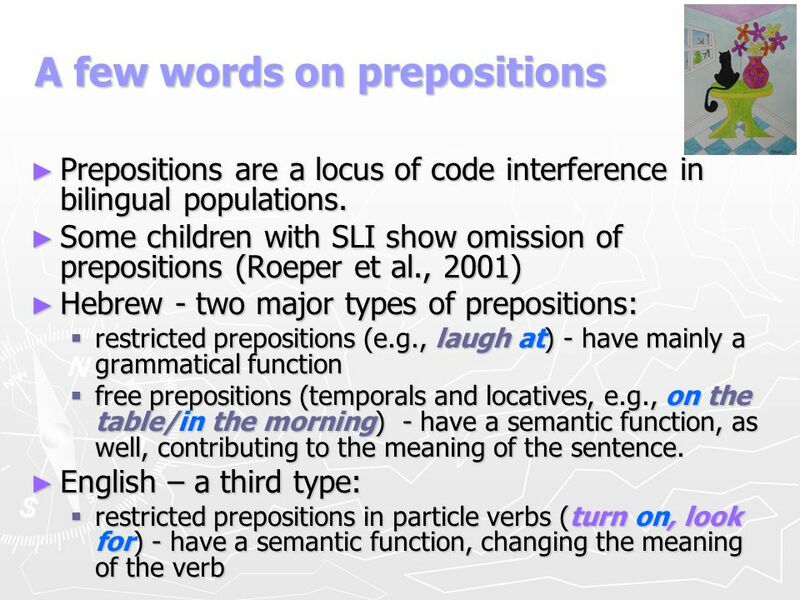 After 2 - They encounter particle verbs in which the preposition contributes to the meaning of the verb in their L1, providing semantic motivation at the lexical level. 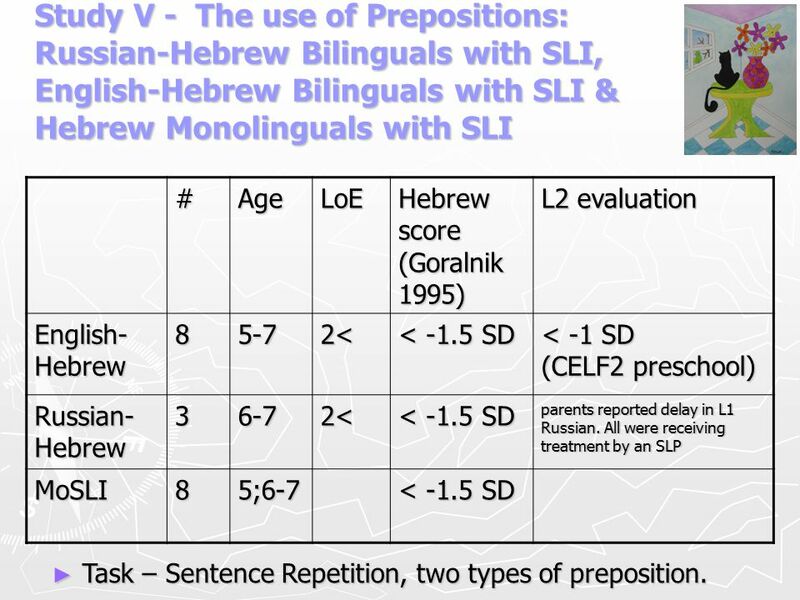 35 Discussion English-Hebrew bilingual children benefit from the bilingual situation in the use of preposition Russian-Hebrew bilingual children, whose L1 Russian has no particles, do not show benefits of bilingualism. 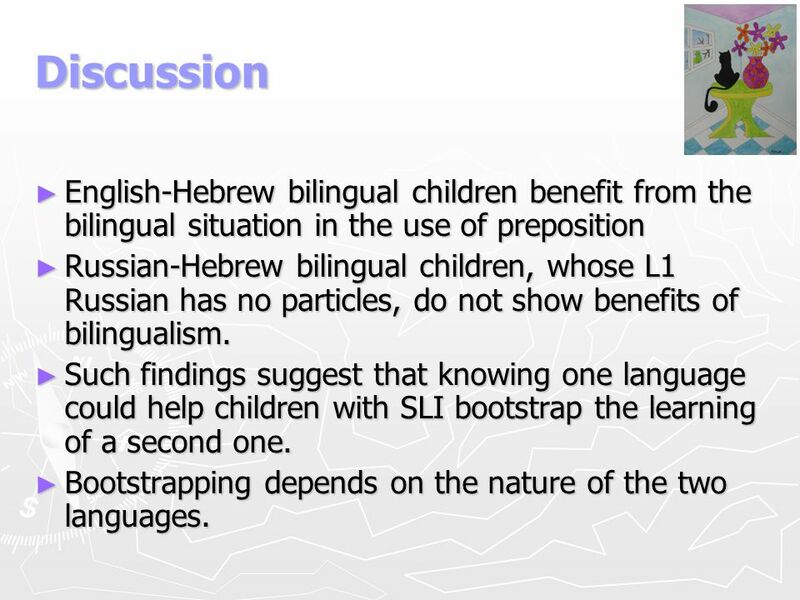 Such findings suggest that knowing one language could help children with SLI bootstrap the learning of a second one. Bootstrapping depends on the nature of the two languages. 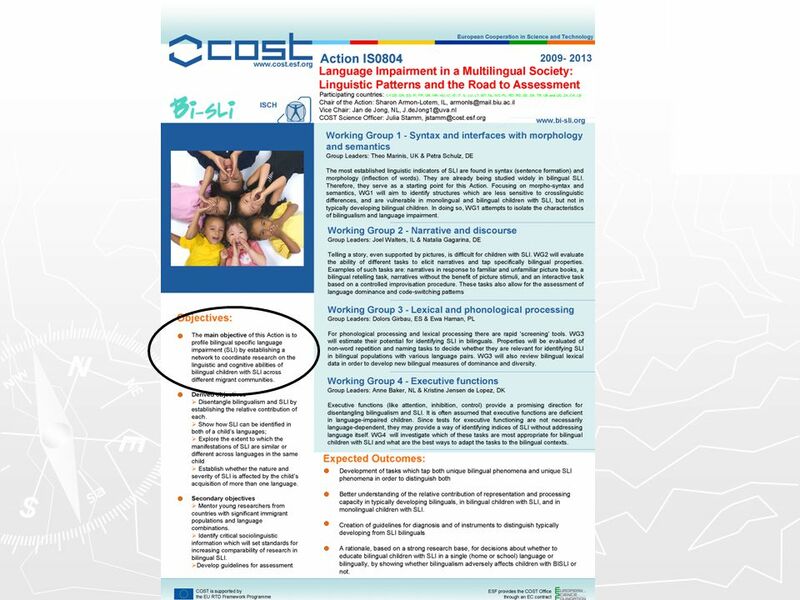 Download ppt "Can bilingualism be a benefit for children with SLI?" HEARING IMPAIRMENT ð Ultimately, we can neither condemn nor support any one type of educational placement for deaf students because multiple factors enter. ©2012 California Department of Education, Child Development Division with WestEd Center for Child & Family Studies (07/2012) 4-1 Chapter 4: Paths to Bilingualism. Delaware Building BLOCKS EARLY CHILDHOOD MONITORING – INSTRUCTION – ACCOUNTABILITY SYSTEM FOR YOUNG CHILDREN Delaware Special Education Meeting September. 1 Code-switching in a network Richard Hudson Bangor February 2008. Encouraging enterprise Moving towards a zero-waste society Developing a capable population Fostering resilient communities Advancing global citizenship. The Acquisition of ECM Jeanne Heil. Different or not different? (1) John seems to be honest (2) John wants to be honest (3a) The cat is out of the bag. The Grade 9 Cohort of Fall 2000: Post-secondary Pathways Preliminary Analysis Presentation to HEQCO - June 15, 2009 Dr. Robert S. Brown Organizational. 1 Understanding Multiyear Estimates from the American Community Survey. Survey of People with Disabilities in the Framework of the Evaluation of the Laron Law Research conducted by Mayers-Jdc-Brookdale Institute and. The Labour Market Integration of Immigrants and their Children in Austria Thomas Liebig & Karolin Krause International Migration Division Directorate for. The 7th Annual Graduate Student Forum at the 41 st Annual TESOL Convention EFL College Student Comprehension Strategies Olga M. Galarraga Sánchez Universidad. 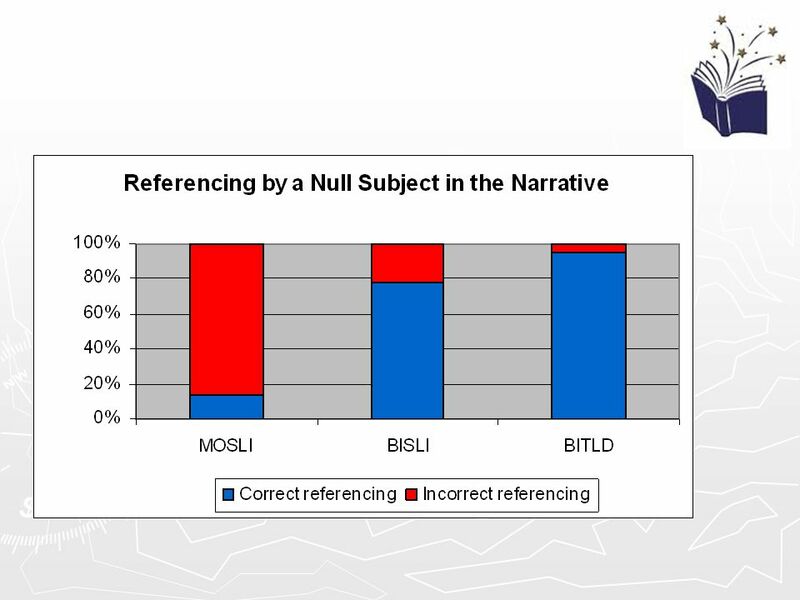 Parent-Child Interaction in School Aged Children with SLI. By Jessica Allen & Chloe Marshall. Language and the mind Prof. R. Hickey SS 2006 Types of Bilingual Acquisition in Childhood Sabine Rubach Hauptstudium LN. CSD 5400 REHABILITATION PROCEDURES FOR THE HARD OF HEARING Language and Speech of Deaf and Hard-of-Hearing Characteristics and Concerns Language Acquisition.